I‘d intended to write a post on a couple of favourite Spanish white wines to coincide with Richard and Stu’s Spanish Lit Month in July, but alas, time got the better of me. And then our hosts decided to extend their focus on Spanish Lit by a couple of weeks, so here we are in August, and I’m still in time for the tie-in! First up is an old favourite, a Spanish white I’ve been buying ever since it first grabbed my attention three years ago: Gaba do Xil Godello, an unoaked godello from Galicia (godello is the grape variety), made by a very talented winemaker, Telmo Rodriguez. This godello reminds me a little of a white Burgundy, but it’s more interesting than many unoaked chardonnays; there’s a mineral note here, a touch of something herby and a refreshing squeeze of lemon. A very well-balanced wine with sufficient body and interest to stand up to seafood, garlic and a bit of chilli heat. If you like this style of white wine but have never tried godello, do give it a go. And moving on to a new discovery: Las Olas Verdejo, from the Rueda region, northwest of Madrid. Another unoaked white, this verdejo has a lovely aroma. At the risk of sounding like something out of fabric softener commercial, the aroma of this wine reminds me of an orchard in summer: slightly grassy, ripe pears and lemon (again). This verdejo tastes a little like sauvignon blanc, but without the stinging acidity that accompanies some wines made from this grape variety; it’s also more flavoursome than many sauvignon blancs. Las Olas (which translates as ‘wave’) is a very interesting wine and great value for money at £7.95 per bottle; another Spanish white for my re-buy list. Wine stockist: I bought both wines from The Wine Society. I tasted the 2012 vintage of the Gaba do Xil Godello – The Society has moved on to the 2013 vintage, priced at £9.50 per bottle. Las Olas Verdejo, 2013 is £7.95 per bottle. If you’re interested in my Spanish Lit Month reviews, click here for a round-up with links. Have you tried any Spanish white (or red) wines recently? Do you have any personal favourites? This entry was posted in Wine Notes and tagged #SpanishLitMonth, Spain, Wine, Wine Notes on August 3, 2014 by JacquiWine. 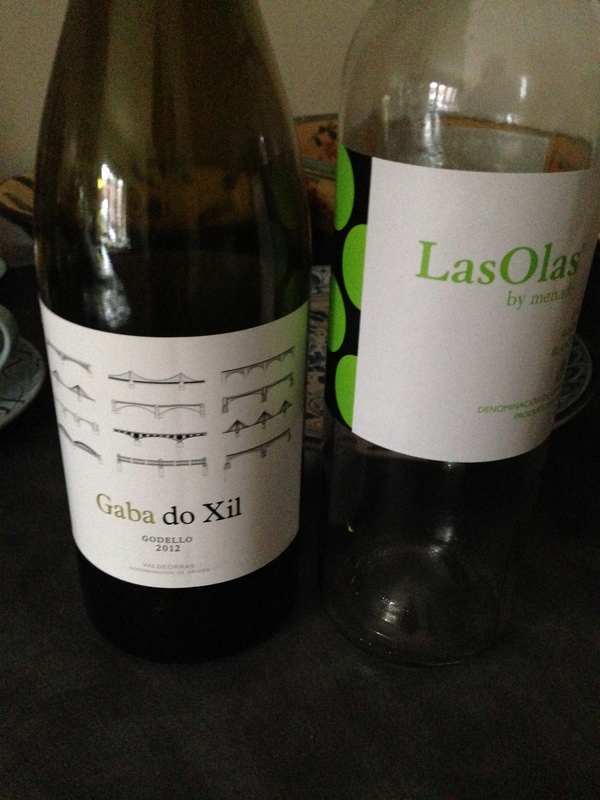 I am deffo going to get some of the Olas Verdejo …..a friend who lives in Madrid was waxing lyrical about Rueda whites ! Great! I love Rueda whites, and they deserve to be better known outside of Spain. I really like the sound of Las Olas Verdejo, too. I used to drink Spanish reds but have come to find them too oaky – that’s me rather than them, I’m sure. Do you drink Portuguese wines, Jacqui? I’m very fond of them but rarely find them in this country. Yes, some Spanish reds (Rioja made in the traditional style, for example) can be somewhat oaky with aromas of leather and tobacco. And I agree, it’s a question of personal taste and preference! Yes, I do like Portuguese wines although I probably drink more white than red (especially in summer) – wines made from alvarinho (which is the same grape variety as Spain’s albariño, grown just over the border in Galicia). Brilliant! Thanks so much, Jacqui. I’ll let you know how I get on.